Duplicate Annihilator for Photos is available here. Click here for all the details. Duplicate Annihilator is fully compatible with Apples macOS 10.14 Mojave. For a limited period of time you can upgrade your current Duplicate Annihilator license (any version) to Duplicate Annihilator Toolbox Family Pack for only $5.95. Read our very appreciated newsletter or why not subscribe to it? mcsolo.com - "For a few dollars more there’s the gold standard for duplicate finding in Duplicate Annihilator"
maclife.com - How To Get Rid of Duplicates in iPhoto! macobserver.com - Cool Stuff Found! cnettv.cnet.com - "it's really the app to use"
411zone.net - Find Duplicates in iPhoto with no effort at all! The only application for dealing with duplicates in Apples new application Photos. Apple is about to replace iPhoto and Aperture with Photos and we need a way to handle those duplicates. 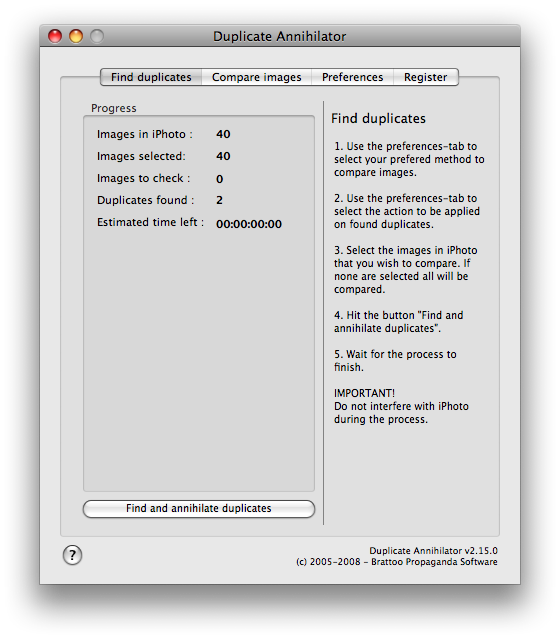 Duplicate Annihilator for Photos takes on the time consuming task comparing the Master images and Versions in your Photos database using effective algorithms to make sure that no duplicates escape. When a duplicate is found the versions of that master will be marked with a description of your choice to make it easy to locate and delete. Easily find and annihilate duplicates created internally by Photos or during import. Compare images using different algorithms to detect and understand differences. Detect duplicates using effective algorithms using electronic checksums like SHA1. Detect duplicates by using file specific meta data such as filename, dimensions, filesize, Exif creation date or date of creation. Mark duplicates with a description to make them easily found using Photos features like search or smart folders. Makes your Photos slimmer and faster. Bug fix for error -1.45.1.-2753. Added support for keeping HEIC images over JPEG. Marking duplicates by Description, Keyword or Assign to Album. Easier to select and change Photos Library. Fixes related to macOS 10.14 Mojave. Fix for Perception Mode where images located in iCloud where flagged as missing. Important fix for Perception Mode and various Minor fixes. Fixed what caused the dreaded error -1.45.2.-10000. Fixed a bug that could cause the fullscan to crash. Fixed a bug which could cause the Analyze tab to crash. Fixed out of memory bug for really huge libraries. 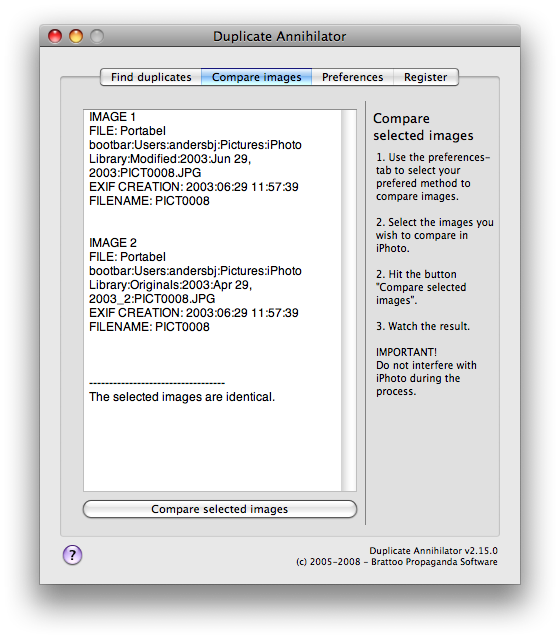 Fix for handling incomplete or damaged Photos library databases. Added support for macOS Sierra (10.12) and Photos 2.0. Added support for Photos 1.5. Fixed bug when appending comments. Bug fix: hang on processing images. Bug fix: hang on finish. Bug fix: error when detecting filenames. Bug fix: clean comment timeout. Bug fix: choose best picture as original. Improved stability, comfort and error handling. Much improved performance when preparing photos. Improved logging and error handling. The leading application for dealing with iPhoto duplicates. Yes, iPhoto protects you from importing duplicates but if you are like the rest of us you have managed to do so anyway. 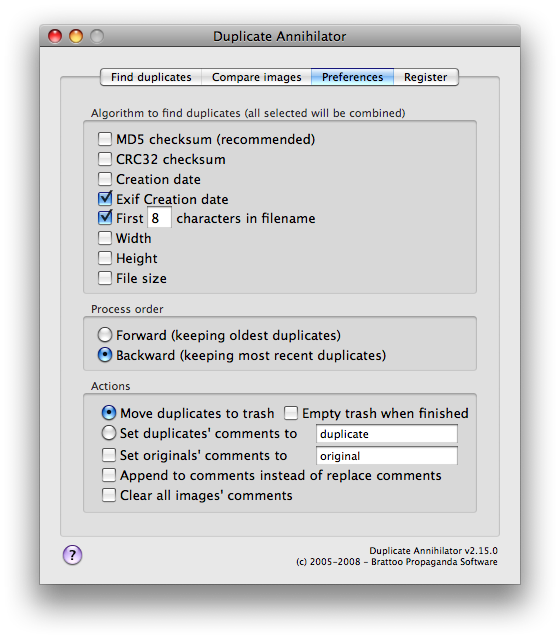 Duplicate Annihilator takes on the time consuming task comparing the images in your iPhoto library using effective algorithms to make sure that no duplicates escape. When found the duplicate will either be marked with a description of your choice to make it searchable or simply moved to iPhoto's trashcan. 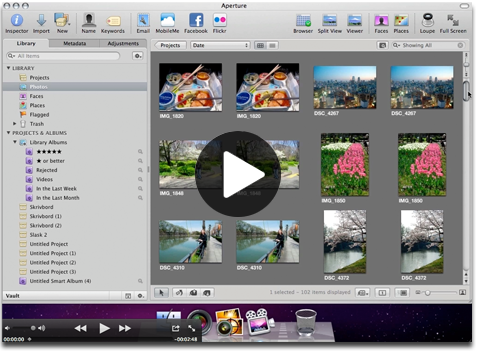 Easily find and annihilate duplicates created internally by iPhoto or during import. Detect duplicates using effective algorithms using electronic checksums like MD5. Delete duplicates upon detection or mark them with a keyword to make them easily found using iPhoto features like search or smart folders. Makes your iPhoto slimmer and faster. Only uses standard Apple features and API's. No hacking nor tampering with iPhoto system files. Your photos are valuable and Duplicate Annihilator is the oldest and most well tested iPhoto duplicate detection software on the market. Duplicate Annihilator has been downloaded over 2.000.000 times by users in over 170 countries. Duplicate Annihilator is used by and recommended by Apple Distinguished Educators, Apple Lead Creatives, Apple Creatives, Mac Specialists and Apple Geniuses in many Apple Stores, Apple Care and Apple Support. If you encounter problems our support team will be there for you. “I just wanted to write to you about how much work and grief you saved me. Throughout the years of multiple iPhoto upgrades and rebuilding photo libraries I ended up with over fourteen thousand photos and I knew that many of them were duplicates but I was too lazy to deal with them. Well, then came a hard drive crash and the prospect of me rebuilding my library once again (I didn't have a very good strategy for backups but I do now) and going through each and every photo to figure out which ones were originals. After a few hundred of these I got frustrated and found your programs and figured that for less than eight bucks I'd give it a shot. “Thank you, thank you, thank you, thank you, thank you, thank you, thank you! I got a new computer and in the process of transferring data from old to new I ended up with many duplicates. Even one photo of my boyfriends mother is more than enough but 5??? ARGGHHH! In less time than it took to order and install Annihilator, 1,254 duplicates were gone. I love how you set the app to 'label' photos as duplicates in comments, so easy to manage them that way! And it makes searching and deleting very easy. I also like getting the registration # immediately on completing order & followed up in confirmation email... I can think of another company or two who would benefit from doing it this way! “It's been just over a week since I got Duplicate Annihilator, and I just wanted to send you a thank you note to say that I am so happy that you created your software. Apple should really adopt the program and add it to iphoto cause it really cleared up a NIGHTMARE for me. I have a mac. About a year ago, one of my 4 kids was into gaming, and decided one day to split my hard-drive in half and put windows on one of the halves. (without my blessings, I might add) Well, he rushed through it I guess, and ended up accidentally deleting my entire operating system. When I came home, there was an empty hard-drive and the windows picture on the screen. I had to go out and buy an external hard-drive (which was good, cause now I back up regularly) just to house iphoto. I started running your programs as soon as I got them, and after several days my iphoto library was reduced to just over 5000 photos. There still are a few duplicates there, but I didn't expect 100% perfection. Now iphoto's back on my computer and I've got some sorting to do, but basically, because of your software, the nightmare's over. Fixed the dreaded Error 1.45.2.-10000. Fixed a bug that could cause the registration to fail. Bug fix: issues with detecting filenames. Bug fix: selecting best photo as original. Fixed issue were valid serial numbers were registered as pirated. Added "slow mode" setting for those where iPhoto runs out of Application memory. Fixed bug that caused originals to be marked when the duplicates were sent to trash. Resolved issue where iPhoto ran out of Application memory. Fixed bug that caused Duplicate Annihilator to freeze on large albums. Overall improved stability and performance. Fixed bug that caused Duplicate Annihilator to freeze while preparing photos. Fixed bug that prevented comments from being removed. Added option to limit cpu utilization. Support for Mac OSX 10.10 Yosemite. Fixed bug that prevented thumbnails from being deleted/marked. Fixed bug that caused photos not to be handled in iPhoto on some systems. Fixed bug that caused all photos to be considered missing on some systems. Faster, utilizing all your CPU cores. Smarter, selects the photo with the highest quality as original in a set of detected duplicates. Overall improved but with the same great features. Improved marking of originals and missing photos. Fixed detection of missing files. 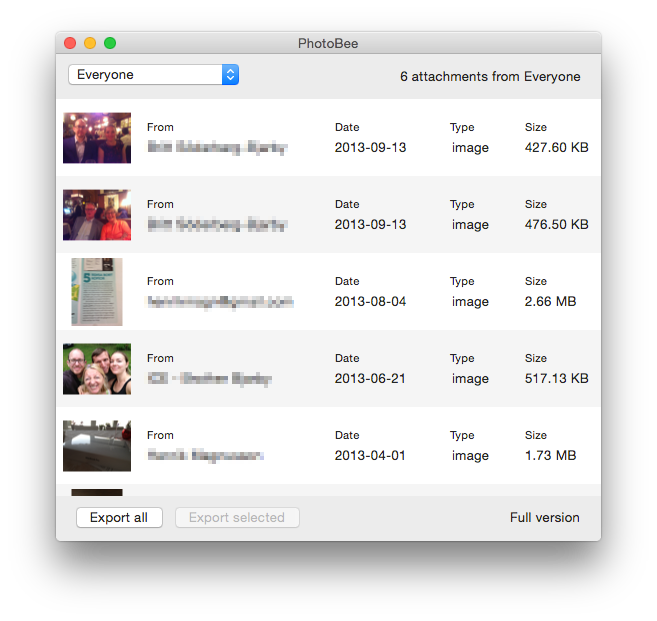 Improved detection of duplicates and missing photos. Added option to mark found duplicates with spotlight comment, useful when using referenced libraries. Now always compares masters instead of previews. Improved debugging, logging and analyzing. Critical bug fix for "Magic mode"
Added "on finish" actions such as "shut down" and "go to sleep"
Apple Photos knows a lot about your photos, with Photos Tagger you can extract that information and assign it as keywords to your photos making your library much easier to organize. Unleash the inner powers of Apple Photos. Apple Photos knows a lot about your photos. It keep track of the people in your photos, the location, date, time and even what kind of things that can be seen in the images. Would it not be great if you also had access to all that information? Well, with Photos Tagger you can. 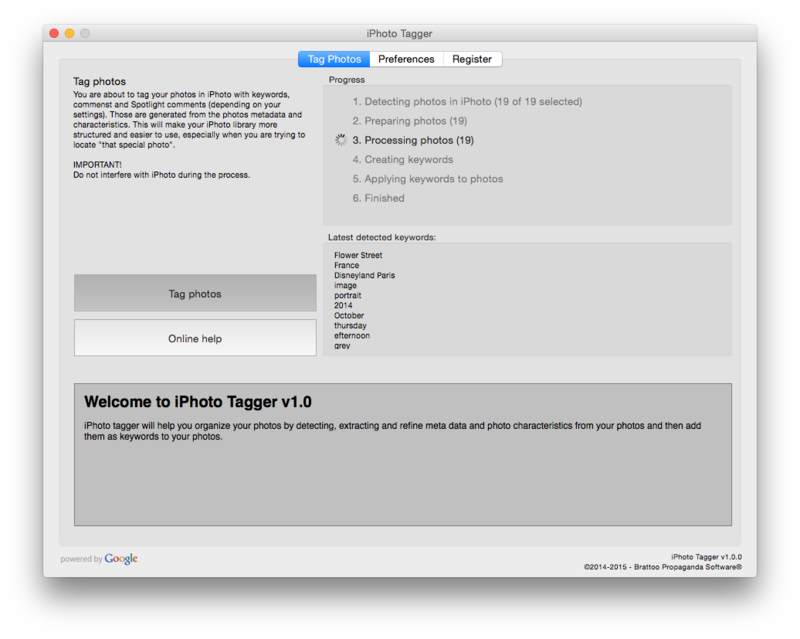 Photos Tagger extracts the hidden metadata from the Photos database and assign it to your photos as keywords. Photos Tagger will make it much easier to find and organize your photos. It will make it easier to set up smart albums based on exactly the things you want. And even better, all extracted keywords will be in your language. Extracts facial attributes such as eyes open, smile, blur (beta). Fixed the 3.255 error loop. Added facial attributes such as eyes open, smile, blur (beta). Better performance on large libraries. Much faster image processing and keyword extraction. Added support for national holidays. Bug fix that prevented registration. 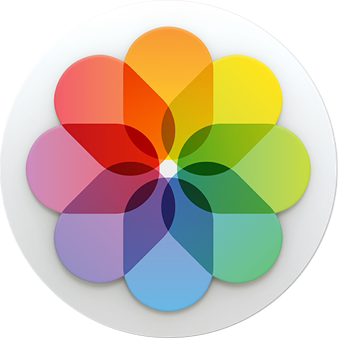 The leading application for dealing with iPhoto duplicates is now also available for Aperture 3. It's so easy to import images to Aperture that sometimes a duplicate or two occur. Eventually that can become quite a task to clean up. 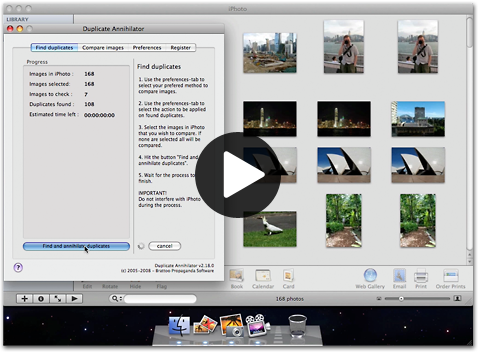 Duplicate Annihilator - Aperture Edition takes on the time consuming task comparing the Master images in your Aperture 3 database using effective algorithms to make sure that no duplicates escape. When a duplicate is found the versions of that master will be marked with a keyword of your choice to make it easy to locate and delete. Easily find and annihilate duplicates created during import. Compare master images using different algorithms to detect and understand differences. Detect duplicates using effective algorithms using electronic checksums like MD5 and CRC32. Marks versions keyword of your choice to make them easy to find using Aperture features like search or smart folders. Makes your Aperture slimmer and faster. The leading application for dealing with iPhoto duplicates is now also available for iOS devices such as iPods, iPhones and iPads. Syncing photos, Photo stream and various photo editing tools can easily result in unwanted duplicates on your iPhone, iPad or iPod. Those duplicate photos consumes lots of precious storage and also makes managing your photos difficult. Until now the only solution have been manual and tiresome work but with Duplicate Annihilator for iOS those days are gone. Duplicate Annihilator for iOS takes on the time consuming task comparing the images in your photo library on your iOS devices, using effective algorithms to make sure that no duplicates escape. Easily find and annihilate duplicates on any iOS device. Works with iPods, iPhones and iPads. Lists the found duplicates so that you can delete them at will. Detects HDR-versions as possible duplicates. Makes your iOS device slimmer and faster. Remember that beautiful pink tree in Kyoto? Can you easily locate that photo? No? Well now you can. Simply search for "Kyoto pink". Organizing your photos have never been easier. iPhoto 8(iLife'09), 9(iLife'11) earlier versions not tested. 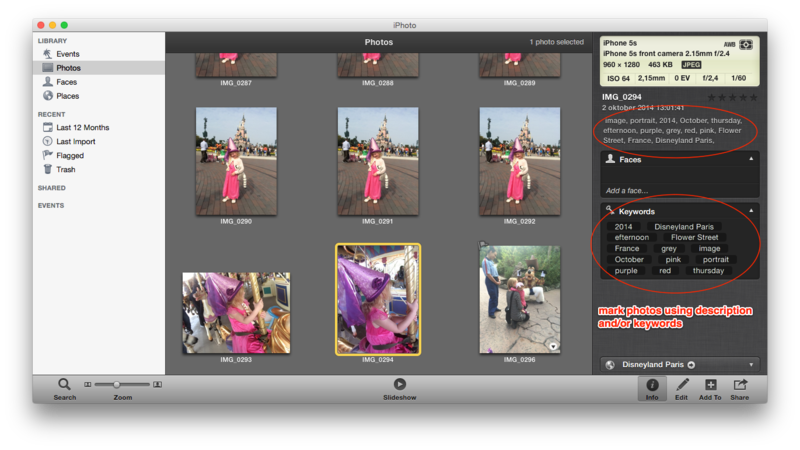 Added "slow mode" option for those where iPhoto runs out of Application Memory. Did you know that photos and movies received in iMessages are not automatically saved? I bet your iMessage flow are full of long lost and forgotten treasurable photos that someone has shared with you. Now, with PhotoBee, you can easily scan your iMessages for those valuable photos and movies and easily download them and keep them along with the rest of your photos. Bringing back all those forgotten but valuable memories. PhotoBee will scan through all your messages in iMessages and list all found photos and movies so that you can browse them and choose which ones to save. Choose a destination from where you can enjoy your recovered photos. Let those memories shared with you revive. Easy selection of which contacts you want to scan for iMessage photos and movies. Only messages available in your iMessage app in OS X will be scanned for photos and movies. You'll find the downloaded file in your Downloads folder. The downloaded file is both the demo and the full version. Try it out, then use your serial number to unlock it.